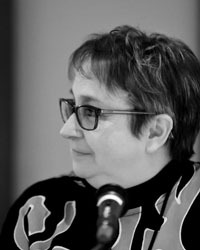 Jacey Bedford is a compulsive writer of science fiction and fantasy with a string of short story publication credits on both sides of the Atlantic.Her first three-book-deal with DAW in the USA began in November 2014 with Empire of Dust, a Psi-tech novel. Since then she's had a total of six books published - the Psi-Tech trilogy and the Rowankind trilogy. She lives with her songwriter husband, Brian, and Eska, a long-haired black German Shepherd dog, a thousand feet up on the edge of the Yorkshire Pennines in a two-hundred-year-old stone house that takes the first hit when the wind howls off the moor. Though she's travelled extensively she's still a Yorkshire girl at heart. Born in Barnsley, deep in the South Yorkshire Coalfield (remember coalmines?) she's outspoken, practical, and has little time for pretensions. She'd rather have a cup of tea than a glass of champagne. She's also - as you might expect from someone Barnsley born - left wing with a streak of coal-coloured humour. She has been a children's librarian, a postmistress, a fisherman's smock maker and a folk singer with the a cappella trio, Artisan, performing to 20,000 people at the Philadelphia Folk Festival, 200 people on the gun deck of HMS Victory and 3 people and the landlord's dog at a pub in Kent in the middle of a snowstorm. Her claim to fame is that she once sang live on BBC Radio 4's Loose Ends accompanied by the Doctor (Who?) playing spoons. (Thank you Sylvester McCoy.) She's recorded 14 CDs and completed 35 international singing tours, 31 of them to North America. Her present day-job is tour manager and music-mum to several international folk artists (see here). She can ride a horse, knit a sweater, make a passable soup from six iron nails (as long as they're magic) and write a web page, but she can't add up a column of figures twice and get the same total, or play more than three chords on a concertina. She loves harmony singing, her family, her dog, words and chocolate, and hates cigarettes, fashion, football and 'traveler' spelled with one L, not necessarily all in that order. She has a stationery fetish and truly believes that a blank notebook has unlimited potential for creativity. She began writing fiction at the age of six and hasn't stopped since, though she'll admit to not taking it very seriously until the late 1990s. He first short story sale was in 1998 and it took another fifteen years to make her first novel sale, mainly because - like many writers - she loves the writing process but hates the selling one. (She's getting better at that, honest!) In the summer of 2013 she finally got the phone call she'd been waiting half a lifetime for. Sheila Gilbert, from DAW said, "I want to buy your book." Shortly after that she hooked up with the Donald Maass Literary Agency and is nor represented by Don Maass himself. She loves making up stories for pleasure and profit! Jacey is a great advocate of professional level critique groups for writers. 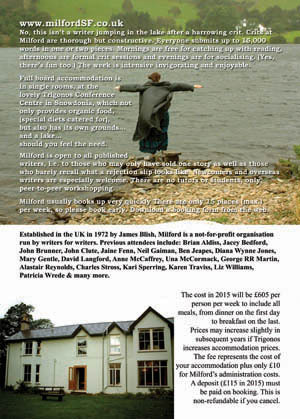 She's secretary of the Milford Writer's Conference in the UK, an annual event for writers, currently held in Snowdonia. 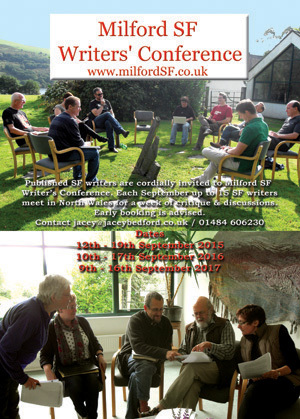 Up to fifteen writers assemble for a week with a chunk of writing (short stoies or novel sections). During the week the pieces are critiqued and discussed. It's a peer-to-peer event with no tutors. Everyone is equal. Jacey's a graduate (or should that be, survivor) of all but three Milfords since 1998, and is already signed up for the next one. Here's the Milford web page. As light relief from writing novels Jacey occasionally writes short stories which have been published in magazines on both sides of the Atlantic, both genre and mainstream, web-only publications, podcasts and print anthologies including four published by DAW, one by Tor, one by Dark Quest, and another by Fabulous Albion. Recent publications include Nature Magazine's Futures series, Buzzymag.com, Trysts of Fate and Grievous Angel. Her stories have been translated into Estonian, Polish, Galician and (unfortunately without permission) Italian. Jacey has been on panels at Worldcons, Eastercons, Fantasycons, Novacons, Bristolcons. Sledge Lit, Andromeda One and is always happy to talk - preferably on a subject she knows something about, and take part in panels. She sometimes presents her workshop on How to Get an Agent, and is also happy to do workshops on topics like worldbuilding or characterisation or planning a trilogy. She attended the Helsinki Worldcon in 2017 and 's planning to attend Worldcons in Dublin (2019) and New Zealand (2020). Sharing a joke with Tony Venables. L-R Juliet E McKenna, Susan Bartholomew, Jacey Bedford, Toby Venables and Anne Lyle. Also on the panel but just out of the picture: Susan Boulton. 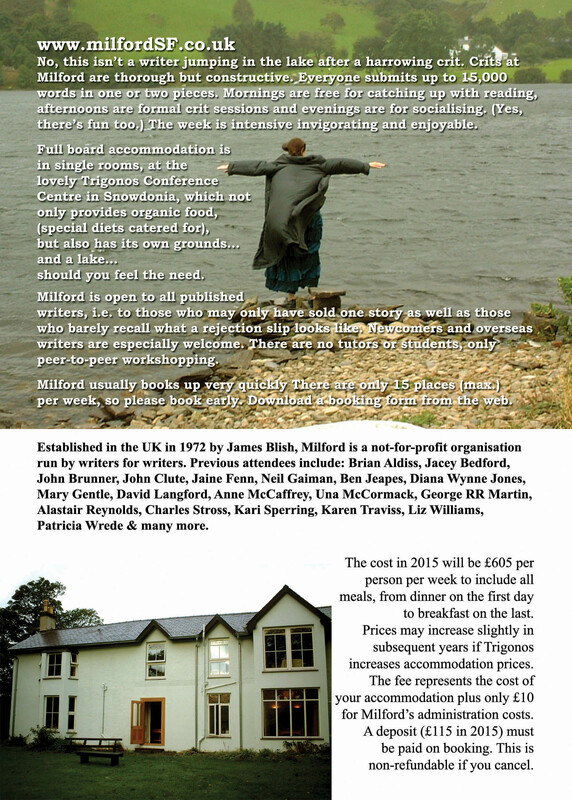 Jacey is happy to speak to writers' groups, at arts/literature festivals and to young people. Please contact her directly for details. She is based in Yorkshire, UK, but will travel.